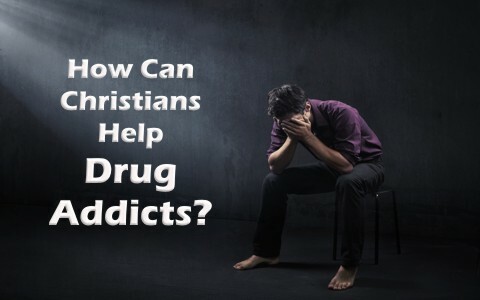 How Can Christians Help Drug Addicts? How can a Christian help someone who is addicted to drugs? What are biblical methods? I believe we will all still battle our own fleshly desires this side of heaven. We might be able to suppress those desires by God’s Spirit and by God’s Word, but all of us will still occasionally fall into sin. There are several people I know who have put their trust in Christ, and yet they battle drug addictions which are so strong that they make quitting cigarettes look like a breeze. These powerful strongholds can be impossible to uproot. In some cases, the person just falls back into despair, and then acceptance. They feel like a hypocrite, but just can’t quit! Are these legitimate believers who are saved? Can a believer still be doing drugs after they’ve been regenerated? I believe the answer is yes, although God alone knows their heart (1 Sam 16:7), so that’s not for me to say. I know a couple of believers who battle with alcohol, almost on a daily basis. These men have put their trust in Christ and believe they have been born again, and they know that drunkenness is sin, so they are seeking help, most of all from God, but from outside resources, and some of these men have gained victory over their addiction. But for some, they’ve fallen over and over again…only to get back up and stay sober for a few weeks. One man managed to go 3 months without a drop, but he fell again. Today, both these men are now in a “dry spell,” so what can we do for people who are addicted to drugs? For one thing, I don’t want to shame them…they already have enough of that. I want to pray for them and love them, and tell them that I am, but at the same time, I want to point out that we are to live lives of holiness before God. I don’t mean perfection, but we should strive to avoid continuous periods where we fall into sin, including addictions. That’s because they can easily become a “god” to us, and they can come before the One, True God. Jesus was speaking to the disciples about bearing fruit for God’s glory (John 15), and He told them, “I am the vine; you are the branches. Whoever abides in me and I in him, he it is that bears much fruit, for apart from me you can do nothing” (John 15:5). Even though Jesus was not talking about a drug addiction, the principle remains; we can do nothing without Him, and nothing includes breaking the stronghold of a drug addiction. With us, it’s impossible, but may I remind you of what Jesus said: “With man this is impossible, but with God all things are possible” (Matt 19:26). The Apostle Paul knew he had to depend on God for all things, but he discovered from experience that “I can do all things through him who strengthens me” (Phil 4:13), but this means the very opposite of this must be true; we can do nothing without Christ if He does not strengthen us. I’m not very good at strengthening myself. I’m not a reliable source of power. God is…and God lives in every believer through the Holy Spirit! Ask for that power in overcoming. Jesus overcame the world, and I believe we can too, although I do know we’ll still sin, but if we rely on God’s strength, we can sin less. I believe every Timothy needs a Paul in his life, just as every mentor needs to be mentoring someone else, so finding a good mentor can help grow us spiritually, but they can also be there to pray for us, and to check up on us, and to ask us, “How did you do the past few days?” to which the person must either say, “I’ve done really good…I’ve been clean all week,” or they can say that and lie about it, which makes them feel even more shame. Even if they’ve lied to you, don’t abandon them. A brother or sister is born for times of adversity like this (Prov 17:17). Seek resources such as Christian counseling. One great resource is from the government. It’s at DrugAbuse.gov, and that’s where you’ll find in depth information about how to treat addictions, even faith-based help, and learn what family and friends can do to help . This site defines detoxification (the process by which the body rids itself of a drug), how to find proper counseling, how to accurately evaluate the addict, and how to deal with mental health issues such as depression and anxiety, but also includes helpful information for long-term follow-up to prevent a relapse. But first of all, the addict must recognize that they can do all things through Christ, but another point is, Christ might use us as a means to help them. If we give up on the drug addict, they might give up on themselves. That would be like watching someone drown while having a life preserver nearby. It’s negligence of the command to help those in need. The Apostle Paul wrote, “Brothers, if anyone is caught in any transgression, you who are spiritual should restore him in a spirit of gentleness. Keep watch on yourself, lest you too be tempted” (Gal 6:1). His point is, we can’t be harsh on them…Paul says we try to restore them, but we do it “in a spirit of gentleness,” and I would add, respect. Don’t forget, they’re made in the image of God (Gen 1:27), so instead, “you should rather turn to forgive and comfort him, or he may be overwhelmed by excessive sorrow” (2 Cor 2:7). If you are sincere about helping a fellow brother or sister who has an addiction, make sure you keep the door open so you can be there to help them but use caution being around drugs, especially illegal ones. You might have to separate yourself from that circumstance if it ever occurs. You want to help them, but you don’t want to be associated with their drug use either. Be clear…no drugs in your car or in your home, but above all, pray for them, love them, and tell them you do both, and support them, don’t shame them. It might drive them off the edge, or drive them further away so you won’t be able to help them at all. Another really good resource for helping drug addicts is also from the federal government. The site has a specific page just for those who are battling drug addictions and those who are seeking to help drug addicts. It’s called DrugAbuse.com, and they state that there are “A variety of addiction treatment centers and therapeutic approaches [that] exist to best match the specific needs of each individual,”  so there is help available. Their toll-free number is 877-981-4884. Deep down, the addict knows drug abuse is sin, and they desire to be free from it…to be clean…and to have a clear conscience. Maybe you can help them get there. Related reading for you: How Can Christians Help Alcoholics? Resource – Scripture quotations are from The Holy Bible, English Standard Version® (ESV®), Crossway Bibles. (2007). ESV: Study Bible : English standard version. Wheaton, Ill: Crossway Bibles. Used by permission. All rights reserved. Treatment Approaches for Drug Addiction. DrugAbuse.gov. https://www.drugabuse.gov/publications/drugfacts/treatment-approaches-drug-addiction (Accessed Nov 20, 2017). How To Help a Drug Addict. Drug Abuse.com https://drugabuse.com/library/how-to-help-a-drug-addict/ (Accessed Nov 20, 2017). Hello Gaga. Please give us your suggestions since you think this is of no help. What would you do? Are believers to sit by and not help others? That’s the first obligation to one another. There are several CHristian ministries that work in these areas, but they are too numerous to mention. It is all based upon biblical teaching so what do you suggest Gaga? I am a recovering drug addict who went to a faith based rehab and I can tell you from experience that those Christians who loved each of us dope heads unconditionally is what got me through the program and on my way to recovery. There is no other way. True my friend. Thank you. If we judge people, we have no time to love them. Next post: Why Did Jesus Have To Die? Couldn’t God Just Forgive Sins?